A systems failure on an Apollo Lunar Module turns from bad to worse in an instant. Astronauts John Campbell and Bill Goodwin encounter a problem so unexpected, it’s never been faced before. Their experience turns their belief systems upside down. The way they look at the sky. The way they believe what they’re told. Everything changed forever. Not that it will matter much. Not from their lonely spot thousands of miles away. They have only hours to find a solution. If they don’t, the moon will become their final resting place, taking their secret with it. Welcome to Moon, the first short story of the Gemini series. This tense, action-packed thriller reveals the race to survive against dwindling life support in a hostile world. 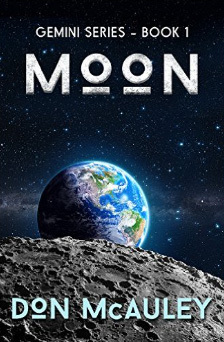 If you love sci-fi with mystery and suspense, get Moon now. “Kept me entertained. Details of the outer space plot seemed authentic. Definitely a Cool short story! I’d be interested in reading the next installment.” TB.